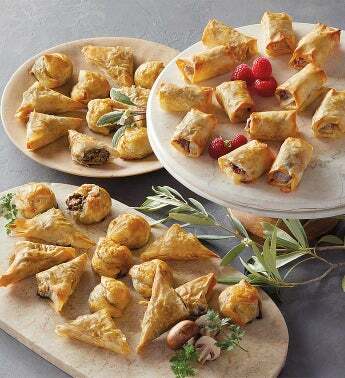 Entertaining is effortless with this assortment of gourmet appetizers. Savory-sweet Brie and raspberry rolls, deliciously seasoned wild mushroom risotto triangles, and petite-yet-mighty beef en croute all arrive ready to heat and serve for an easy and elegant addition to your next gathering. Your guests are sure to be impressed.